Some time around the seventeenth and eighteenth centuries cities made the switch from wells to underground supply. For instance, in London firefighters used to extinguish fires using water from nearby wells. For the next step the city used hollowed out logs as underground conduits for water. At this point in history firefighters had to dig to these log-pipes and tap into the water supply each time something went ablaze. Eventually, cities made this job easier. A series of wooden spikes were pre-inserted into the supply for easy access. 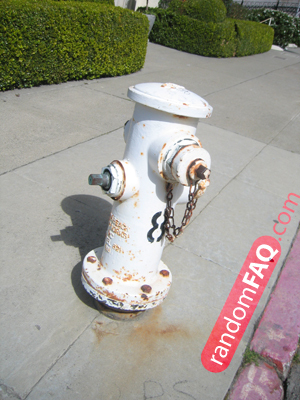 These markers ultimately evolved into modern fire-hydrants.